In honor of sweet Marybeth's birthday a new DOGS & CATS keychain series is donated to the Cornwall PEZ museum. This is a rare set. We have not seen it promoted anywhere nor seen a single character on ebay. We just came across it at Cost Plus store a few weeks ago. You may notice that the characters are mini versions of the PEZ Furry Friends series of Dogs and Cats already in the collection. What do you think family? This year PEZ has started a MAJOR LEAGE BASEBALL Series. We do currently have a generic baseball - see below. So we have a BASEBALL PEZ in the collection. Do we want/need these first 11 of a series which could possibly grow to include all 30 MLB teams? 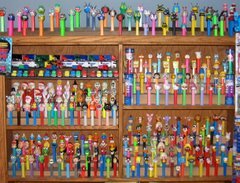 It's really just a lot of the same PEZ with a different printed logo. Or shall we just get LA and Boston? Every 16 year old hopes for a new car on their birthday. So as not to disappoint our last 16 year old from 336, Sarah gets a new spezcial edition Daytona 500 race car. This car will join the other Nascar racers in the pull-n-go series. It is a companion to the Daytona 500 helmet and hauler recently added to the collection (see Robbie's birthday). One of the funnest things is to find a PEZ that you never knew existed. We have never seen this in any collection, on e-bay or anywhere before we walked into the Duarte Wal-mart and there it was... the only one in the whole display of dozens of cars.